Dr. Nasir Amir graduated from Allama Iqbal Medical College Lahore. He embarked his career in the field of General Practice and completed his training from Mayo Hospital Lahore. After working in Ameer Clinic and Rasheed Hospital Lahore, his passion to help the ailing humanity and his further quest of knowledge excelled him to earn the Membership of Royal College of General Practitioners from UK. Earlier accomplishment of his experience while working in South Africa, Singapore and Italy paved his way to serve the multinational patients in the NMC Royal Hospital Dubai. 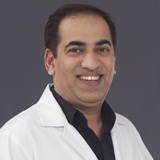 He feels privileged to help the multilingual patients as he firmly believes that every patient is unique and hence needs a customized and tailored management. After having vast experience of working in the Emergency Department and outdoor, he is now the medical director at IMG world Dubai, NMC Clinic a branch of NMC Royal Hospital Dubai Investment Park. In spite of his busy schedule, he is always keen in learning the recent advances in the medical field by actively participating in local and international seminars, workshops and conferences. Moreover, he has valid BLS, ACLS, PALS certificates. Dr. Nasir is always keen to manage the chronic illnesses such as Asthma, Hypertension, Diabetes Mellitus, Acute and Chronic Heart Disorders, and most importantly Dermatology. His areas of special interest are cosmetic lasers applications in Dermatology and different hair restoration techniques in hair loss. He believes that better communication can help the patients to manage their health concerns in a better way. He can speak English, Urdu, Hindi and Arabic.